Manufacturer of direct driven axial fans ,centrifugal fan . 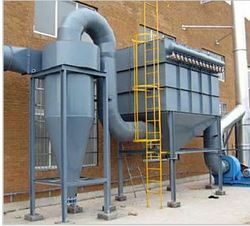 For over 40 years, Industrial fans India have supplied quality commercial and industrial dust collection systems that serve our customers for all their air quality and filtration requirements. The impeller has adjustable blades which make it possible to adapt the fan to the requirements of the plant. Shorter ducts, thus lowering the cost of the system. We offer long and short cased Axial Flow and plate mounted axials to suit all requirements and applications. Our standard long cased axials feature a galvanised finish with rolled flanges and a range of accessories to suit (mounting feet, guards, matching flanges etc). Cases are available from stock up to 1000mm dia. (1250mm dia to order). Available with a range of impeller options (Aluminium as standard), and to suit single or three phase applications. These fans are available on a 2 – 3 day lead time for most applications. Louver dampers are best applied to balance or control flow. 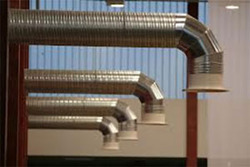 The normal leak path of 0.7% of duct area produces a three to five percent leak rate in average applications. As a general rule , a damper should be used in the middle third of the control range for best results. This gives equal percentage in either direction should the need arise. Your DDI representative can advise you the way your control requirements can be met. A variety of options are available. Metallic spring seals, sealed (dust tight) blade ends, shear seals, and many materials are available. This custom equipment is designed specifically to fit your application. Leakage performance of a louver depends on ratio of flowing to shutoff pressure, design temperature, number of blades, and blade edge treatment. Since the first two are system related, the last two are the usual areas of improvement. Reduction of number of blades reduces leak path to the limit that a single blade has only perimeter leakage. DDI louver dampers are full welded equipment designed for long service, low maintenance, and easy repair. DDI louver dampers are full welded equipment designed for long service, low maintenance, and easy repair. Damper Operators will be specified, supplied, mounted, and tested when requested. A wide variety of operators can be specified-electric, pneumatic, hydraulic or manual - you choose the one best suited for your particular application. The double wall air sealed DDI BiPlane louver damper has no equal where total isolation by a louver style damper is required. The rigid blade structure and aerodynamically clean blade faces assure predictable flutter control whether the linkage is parallel or opposed. The single set of shafts allows the number of blades to be minimized. Even wide blades can be contained within the minimum duct space required by a double louver. In addition to eliminating the need for a second set of shafts, the wider blades allowed can reduce the number of blades in the damper. The smaller number of shafts substantially reduces the bearing and packing maintenance and operating torque. The DDI BiPlane can advantageously replace some guillotine dampers. It eliminates the need to continuously run a seal air fan in applications where the damper is normally open. The savings in fan motor power consumption will pay the entire cost of the Biplane double louver. In addition, the BiPlane minimizes cooling of the duct gases and eliminates air dilution when the damper is open. The sealing plane of the DDI BiPlane damper is barely thicker than the blades themselves. 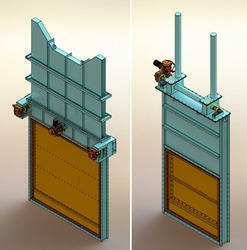 This compact structure allows much more freedom of duct design than a conventional double louver. Shorter ducts, thus lowering the cost of the system Belt driven axial fans are used in situations where it is important that the motor is kept out of the airstream due to the type or temperature of the gases/fumes involved. An additional advantage is the accessibility of the motor allowing easy maintenance. All as above but these fans are used in situations where it is important that the motor is kept out of the airstream due to the type or temperature of the gases/fumes involved. An additional advantage is the accessibility of the motor allowing easy maintenance. Fans for Normal temperature (NT) – suitable for continuous temperatures up to 80 ° C.
Fans for high temperatures (HT) – suitable for up to 150 ° C.
Fans for extra high temperatures (EHT) – suitable for up to 250 ° C. Cases available from 150mm dia. Up to 1250mm dia. Available in galvanised, mild steel, stainless steel and polypropylene construction. Steel fans available certified to 600 ° C for one hour. Belt Driven Bifurcated Fans All as above but with the additional advantage that the motor is accessible for easy maintenance. Used on flat or sloping roofs and suitable for exhausting warm and contaminated air. Capable of up to 60 ° C with propeller fans and up to 600 ° C with bifurcated fans. Single or three phase options available and flameproof enclosures. These fans can be constructed in mild steel (cowl epoxy coated after manufacture), stainless steel or aluminium. Other options include silencers and run and standby motors. Non-standard sizes available on request. Industrial Fans committed to the design, development and production of high performance ventilation fans, ducting products for industrial, commercial, underground mining and tunneling applications. Our expertise, experience and process result in an unparalleled level of performance and quality. We are offering a range of Ventilation System, which is known for maintaining excellent air flow around the workspace. The Ventilation System is known for its high performance and International standard, and is highly customized to attain customer satisfaction. Our range offers high productivity with low maintenance needs. 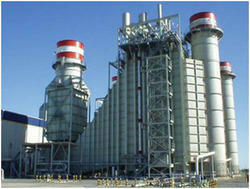 Because of the superior quality, our range is demanded and acknowledged by many industries and our customers. • 4. Diverter drive shaft and integral levers designed as lattice structure – no heat distortion-reduced loss of free damper area – lower weight. We offer standard long cased axial fans in sizes from 250mm dia. Up to 1250mm dia. Axial flow fans capable of 400 ° C for 2 hours (many available with ex-stock motors). Bifurcated fans capable of 600 ° C for one hour. Fast turnarounds available on most requirements. Manufactured from UV stabilised GRP in goose wing grey these cowls feature a zinc plated steel inlet guard on the df Cowl ischarge side. Available to suit a variety of Greenmount axial fans these cowls accommodate axial fans with adjustable pitch impellers for the maximum performance requirements. Backdraught shutters, purlin boxes, soaker sheets and drop in silencers to suit are also available. In principle all fans can be reversed, but with much reduced performance data. Fans with an R (f. i. GDR) are nearly 100 % reversible by using special impellers and other special features. For installations where the motor can not be in the airflow, we offer the designs S or T. They are for example used for applications with highly flammable gases or for material transport fans. Both designs use a V-belt drive. In design S the motor is mounted on the fan casing itself, while in design T the motor is on a separate base frame. The standard impeller programme has four main types, N. M, X and Y with 6, 8 or 12 blades. By using guide vanes with 5 or 15 blades a high efficiency at high pressure is obtained. For many applications (industrial or ship building) the designs A and G (GT for jet fans) are used. The designs have a long casing that fully encloses the motor, with an external terminal box. The design A has a service access to allow minor servicing. A special case of design G (GT for jet fans) is the design GD (GDT), which has an inlet cone instead of a flange for free inlet. In some installations it is important to be able to often access the impeller or the motor without disassembling the whole system. For this kind of applications we recommend our design B or W, WD. By having the impeller /motor mounted on a swing out type access door, all type of service and maintenance can easily be done. For free inlet operation fans with free inlet as DD or E should be chosen. Our impellers have all aerofoil blades with high efficiencies and favorable noise ratings. Of course electric motors are normally supported symmetrically, without feet disturbing the flow. The blade angle can be adjusted at standstill, a big advantage when for example the duct system is modified. The aerodynamically shaped impellers are made of corrosion resistant cast aluminum alloy. It's low weight gives good life expectancy for the motor bearings. The quick selection tables/nomogramme is an aid for quickly selecting the most suitable impeller.